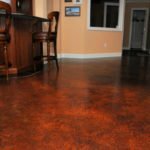 In the world of decorative concrete, stained concrete is one of the most popular methods for enhancing a plain concrete surface. It comes in two types: acid and water-based. Acid stains produce stunning effects due to the chemical reaction that happens between the stain and the concrete. Water-based stains do not induce chemical reactions and, instead, produce consistent and uniform colors all throughout the space. Here are helpful tips you could use in a concrete staining project, be it a DIY or a professional hire. Before a concrete acid stain could be used on a concrete surface, the slab needs to be etched. The etching process is necessary to open up the pores of the concrete and enhance proper adhesion. 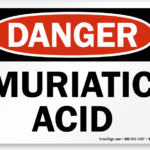 The most common chemical used in etching is muriatic acid. It is important to note that it can deplete lime content in the slab, therefore, creating less pronounced effects. Do not rely on color swatches or photos of completed jobs. The stain color that you choose may dry a bit differently on your concrete space. To get an accurate idea of how it would look like once it dries on your concrete, test the actual stain on a hidden part of the slab. Let it dry and check to see of the end result meets your expectations or not. It is true that concrete stains can be used on both old and new concrete surfaces. However, it is important to note that “new” pertains to a fully cured concrete slab. Oftentimes, the curing time for concrete is around 28 days. A concrete acid stain surface must be rinsed really well after it has dried and cured. Pros often rinse with water through a hose. The rinse water needs to be disposed of properly to keep it from getting to the lawn or garden and killing a few good plants with its high acid content. 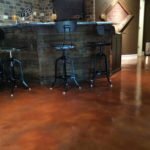 Whether you are staining your concrete by yourself or hiring a pro to do it for you, these tips should come in handy. These will help guarantee a successful staining project and long-lasting stained effects on any concrete surface, be it indoors or out. 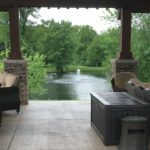 For more helpful tips, you may consult a pro who specializes in decorative stained concrete work.